I’ve been a Lush Lover for about…mmm…10 years? Maybe a little more, maybe a little less. I’m so old I remember Cosmetics to Go! Moral of the story is no matter how many years I know, love, and adore the brand, I never get tired of the seasonal collections that get released. Some may wonder at my strange, unusual obsession over bath bombs, bubble bars, and shower gels but true Lush fans just get it. 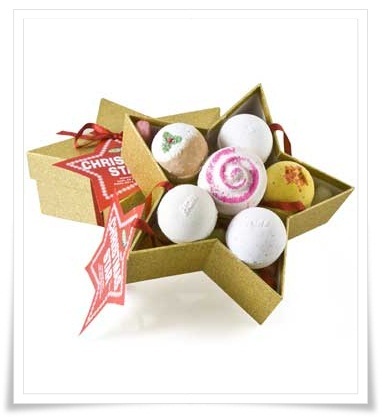 Today I have some more lovely Lush Holiday 2010 goodies to share with you which have begun popping up on the Lush UK website. Christmas please hurry fast! I need these delicious Lush goodies in my life. Warming cinnamon, refreshing sweet orange and almond essential oils. Includes Vanilla Fountain, Li’l Lush Pud Bath Ballistics, Smitten Hand Cream, and Snowcake Soap. Includes Avobath, Butterball, Big Blue, Winter Bath, Cinders, So White, and Mrs Whippy Bat Bombs. Includes: Fizzbanger Bath Bomb, Mandarin’s Tea Party Soap, Winter Bath Bomb, and Christmas Eve Bubble Bar. Includes: Snow Fairy Shower Gel, Rock Star and Honey I Washed the Kids Soap, Candy Cane Bubble Bar, Bubblegum Lip Scrub, and Snow Fairy Lip Tint. Includes: Satsumo Santa, Bearded Lady Bubble Bar, and So White Bubble Bar. Fresh avocados and bananas, and jojoba and almond oils. This jelly bean fragrance is even more intense, with hints of blackcurrant to make your hands and body smell like a cross between a confectioner’s shop and a bowl full of berries. Refreshing citrus soap, organic lemon myrtle for a fresh, slightly herbal citrus note, and lemongrass. Summery Orange Blossom with crystallised ginger. Vanilla absolute with shea and cocoa butters plus black pepper and ginger oils. Glögg Shower Gel and Mandarin’s Tea Party Soap. Includes: Snow Fairy Shower Gel, Candy Cane Bubble Bar, Angels’ Delight Soap, Sugar Plum Fairy Sugar Scrub, Sherbet Lemon Lip Dip, Twilight, and a pot of tropical Iced Wine shower jelly. They have a new Lip Slip upcoming, new shower gel, and a few other interesting bits and bobs coming along for the Holiday ride. Christmas can’t come faster enough for me. Please click here to see more of Lush Holiday 2010. Lush Snow Fairy Shower Gel You NEED It! the Muse’s 12 Days of Christmas Giveaways: Day 2 It Isn’t Christmas without Lush Snow Fairy! Oh my goodness… I want everything. I actually woke up early this morning to check out Lush UK’s website. I decided not to order during the party today (self restraint–shocking!! ), but I probably will as soon as it comes online for good. There is so much that I want! stephanie DITTO ;-D I didn’t even attempt to log into the forum the last few weeks for fear I’d do damage any special fragrances? OMG… o…m..g… want want want!!! WOW!! It’s going to be a good Christmas this year! 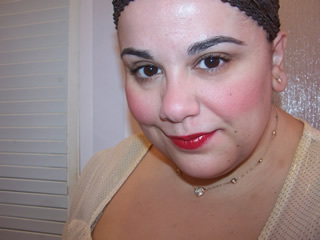 : D Hey Muse, do you know what sort of product Lip Slip is? Looking forward to the glögg shower gel. Swedes drink lots of glögg during christmastime! ha ann ;D weirdness! I can’t wait for glogg either! was hoping for an image but nothing up sigh! jenna that’s my fav box ;-D Lush does a similar one every year and I adore it! must have in 30 seconds or i will explode! Thank you SO MUCH for posting all of this!! I became a lush fan thanks to you and can’t wait to try some new things! aw elizabeth totally warms my heart ;-D I love when people tell me that!!!!!!!!!!!! I can’t wait to get some of these goodies. Is this your 1st Lush Christmas?! thanks so much for posting this! I check your blog every day and it made me so happy to see this post! aw thank you SO much Colleen! xoxo! If you had a like button, I would probably press it 10 times just for this post (if that’s even possible). It is my first lush Christmas!! From what I have read, they have a great after xmas sale that I am looking forward to as well!!!!! I’m so glad they brought back Cinders and Snow White! I attempted to be cheap last year and waited for the Boxing Day sale and missed out on Lush. This year I will definitely buy some beforehand! OMY this is incredible! I want almost all of it.. look at the soaps! , the massage bar, and the shower gel.. aiieee! aw shucks cham love ya back girl! Ah! I can’t find these anywhere! Can you send me the link where you found them? Great blog by the way :). thanks Erin glad you are enjoying it. I don’t see these on the site so it must mean they were only up for a teaser? Any idea when they come out? this is my first LUSH Christmas! I am excited!!!!!! Hi Neon I answered this for you already ;-D Hope it helps! OMG that is a lot. The Stardust kit shall be mine! This is my first Lush christmas. So this may be redundant, but will all of this be in stores stateside or just a selection? I work 5 min from a Lush kiosk!! hi PJ! all in store but it comes a tad later to stores, so around middle, later November. the gifts always do but never the individual products if you know what i mean. and i’m in the USA if it makes a difference. thanks emma love back to ya! <3! <3 what do you look like by the way?